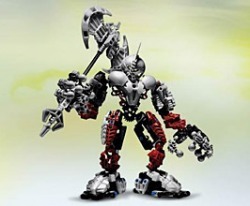 Lhikan, guardian of Metru Nui before the coming of the Toa Metru, carries two lava greatswords that can be combined to form a flying board or a shield. The Kikanalo is a mighty herd animal, whose stampedes are feared even by the evil Dark Hunters! 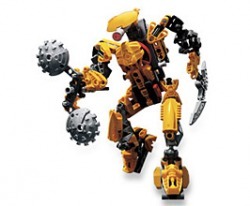 Brought to life by a horrible accident, the seventh Piraka called Vezon dared to try and steal the Mask of Life for himself. 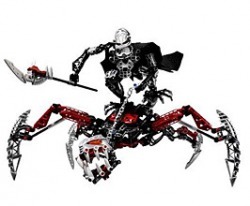 But the mask cursed him to be fused to the monstrous spider Fenrakk and serve as a new guardian of the ancient artifact. Now the mad Vezon and his terrifying steed wait for anyone brave enough – or foolish enough – to try to steal the mask! The dreaded Karzahni, powerful ruler of his own realm, has traveled to the Pit in search of the Mask of Life. 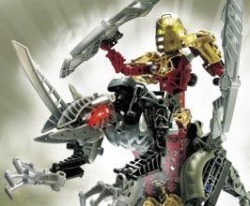 Can two brave Matoran, Sarda and Idris, hope to trap him and end his reign of fear? 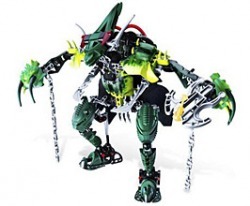 The Mask of Life gathered stray molecules and became mortal, the Toa Ignika. Now, flying on a powerful skyboard and armed with a Midak Skyblaster and keen sword, he is determined to be a hero! Powerful and easily enraged, Nocturn prefers to dwell alone, feeding on razor whales and giant squid. 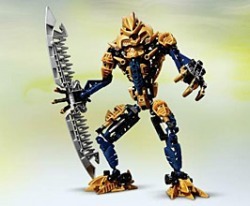 His possession of the Mask of Life will spark a war beneath the waves that threatens all of Mahri Nui. 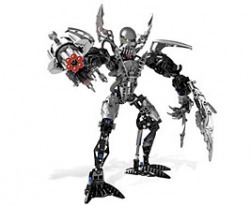 This robotic guardian of the Pit has been taken over by the evil Makuta as part of his ultimate plan to seize power in the universe. 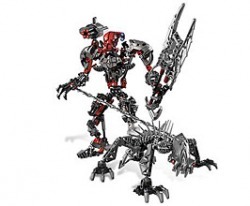 Aided by his energy hound, Spinax, Maxilos uses his twin-bladed black fire sword and shoulder-mounted Cordak blaster in battle. But whose side is he really on? 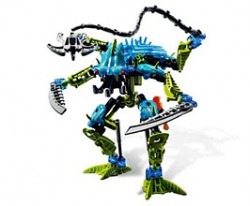 Hydraxon is the powerful armored figure assigned to guard the Pit and now he's after the Barraki! 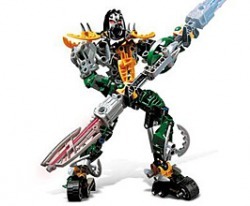 A master of every known weapon, he's armed with boomerangs, wrist knives and a Cordak blaster. 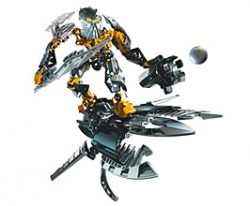 Runners don't have a chance when Hydraxon's on their trail!